TAMPA, Fla. (UMNS) –– After a morning of major addresses and after a lengthy session establishing rules for legislative processes, delegates broke into 13 legislative committees to elect officers. The Rules Committee also proposed that “any legislation not acted upon by the legislative committee at the time of the Saturday evening adjournment shall remain unfinished.” Judy Nutter, a delegate from West Virginia, argued that the new rule was not keeping faith with people who had submitted proposals, but delegates agreed to retain the rule knowing that it only takes 20 delegates to bring any petition to the full body. After electing officers for the legislative committees, delegates broke into small groups for two “holy conversations” – one on the “Foundation on Identity and Theology” and one on “Human Sexuality.” The goal of each group was not to change opinions, but to discover how persons with varying opinions can live together as brothers and sisters in Christ. 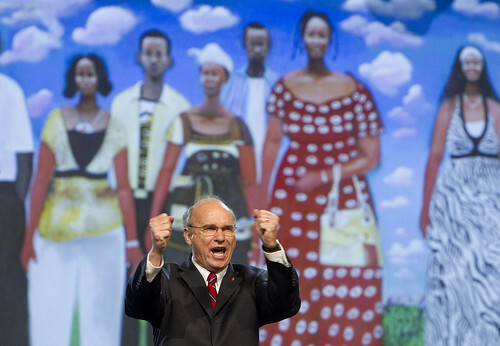 In a stirring moment in the quadrennial address, Weaver introduced four teenage boys who had escaped near-death experiences when caught between genocidal conflicts between Hutu and Tutsi tribes in the Democratic Republic of Congo. Even after evacuation, rebels attacked the refugee camp where they had sought safe haven, killing 166 people, nearly one-fourth of the camp’s residents. The United Nations resettled many of the survivors and the boys came to New Hampshire, where they were welcomed by a United Methodist congregation. Weaver baptized the boys in a New Hampshire river. “As part of my personal transformation, a part of me had to die so that the rest of me could live,” he said. “Today, as we struggle to transform our lives and our churches, we must realize some things are going to have to die, some things are going to have to be left behind so that we can continue to live and thrive.